Alan Titchmarsh was wrong. AMD Garden. Alan Titchmarsh was so wrong with vast amount of white both for the fencing and the wide marble-like paths with the added insult of topiary! Green is restful for the eyes. White is great with green plants. Yellow is bright and cheery. Bright Red is good mixed with white. Blue is good in vast banks , eg bluebells. No pink (looks brown or dead) no brown (it is dead or dying,) no purple (as it looks like brown or black). No mixed colours in one bloom as they blend into a mess or pink or brown. 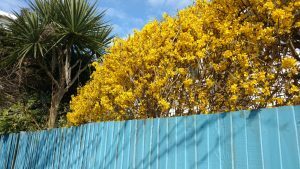 Hedges or shaped bushes of Forsythia or Hypericum (fences painted pale blue give a superb contrast ) In winter the sweet smelling shrubs. I also use Bay trees and Rosemary. A Yellow bed, with polyanthus, daffodils, yellow tulips, yellow azalea, yellow dahlias, yellow gladioli, yellow chrysanthemums. A Red and white bed: red tulips, Busa Lilies, roses, geraniums, peonies, dahlias, chrysanthemums. An Orange bed: French Marigolds, orange osteospernums,. Kitchen garden of plants for touch or smell, eg sage, rosemary, mint, thyme, parsley, dwarf french beans, beetroot, leeks, onion sets (with Petunias), chives, garlic, lavender plus Tumbling Toms (some need a raised bed) and also night-scented stocks. Wherever possible scented climbers, like jasmine, honeysuckle, clematis, sweet peas,. Indoor plants eg Greek Basil and Basil.